In the dynamic environment of International trade, the importance of Maritime Supply Chain cannot be underestimated. More specifically the container logistics sector had a very important role to play in facilitating the global trade development. Due to the increasing importance of container logistics, the development of optimal inland logistics has become inevitable. So, the development of dry port has been a very important part of this whole process of providing more efficient and faster logistics facilitation. 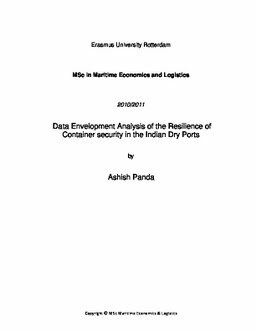 In this thesis an attempt has been made to understand and analyze the complexities and problem related to the security of the container transport related to dry port and inland logistics. Legal regimes have been analyzed from theoretical as well as practical point of view. A study about the Gaps in the available legal regime has been done. At the same time the practical issues related to security have been understood. Even if there are laws it is always tougher to implement them especially if they are not economically and practically feasible. Although implementation of security measures is considered to be an extra cost, still the threat to security cannot be ignored especially when quality of service level is considered to be a competitive advantage for the dry port. Supply Chain Resilience has been gaining significance in recent times as more unpredictable events are expected to occur and subsequently have adverse effect on Supply Chain efficiency. An attempt has been made to quantify dry port resilience and dry port security. The quantification of the dry port resilience takes both capacity and flexibility into account. At the end an attempt has been made to measure the efficiency of a dry port in terms of TEU throughput, dry port security and dry port resilience. The results have been analyzed with respect to the public and private dry port performances.